A roof stained with black streaks and darks stains not only detracts from your home’s curb appeal, but the shingles are also being damaged, diminishing the life of your roof. Extend the life and beauty of your roof with proper maintenance. A professional roof cleaning service can safely remove roof stains with non-pressure roof washing combined with environmentally safe, biodegradable cleaners and preventive treatment. It is important to avoid the use of power washers because asphalt shingles are not designed to withstand high pressure, and permanent damage will result. Proper professional roof cleaning extends the life of your roof, and delays the expense of roof replacement. Many Cape Cod homes are stained by roof algae, Gloeocapsa Magma, moss, mold, and mildew. These organisms tend to flourish on the north side of the roof, where the most shade is present, and moisture tends to accumulate. The algae and mold will continue to grow and spread rapidly if the roof is not cleaned and treated, and ultimately it will damage your roof. If the roof is not treated, this algae will cause granule loss making the shingles vulnerable to wind and rain. If you have a wooden roof then the algae will cause the wood fibers to deteriorate rapidly. Not only is the roof at risk of damage, but a roof covered in algae retains heat during the hot summer months, resulting in higher energy bills for cooling expenses. Make sure that you contact a certified roof cleaning company that has workers comp insurance, general liability insurance, and offers a warranty package with their service. The warranty will verify that they are using a process that actually kills the algae, instead of just cleaning the surface, allowing the algae to return quickly. A proper treatment will kill the algae at the roots, preventing its return for years! About the Author: Zach Maynard is a certified roof cleaner, and owner of A to Z Roof Cleaning. 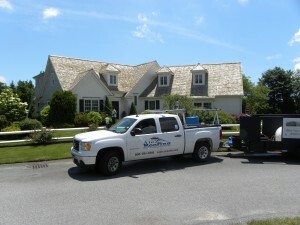 He has cleaned & serviced hundreds of roofs throughout Cape Cod since 2005. He can be reached at 800-781-0136.